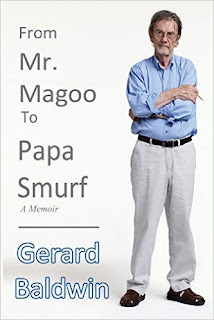 Readers of either of my books, Mr. Magoo's Christmas Carol, The Making of the First Animated Christmas Special or The Art of Jay Ward Productions will instantly recognize the name Gerard Baldwin. Baldwin was responsible for directing and animating the highly memorable, show-stopping sequence featuring the Despicables in Christmas Carol. 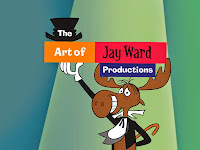 For Jay Ward, he directed and animated many of the best episodes of Fractured Fairy Tales, Aesop & Son and Dudley Do-right at Jay Ward as well as animating several pilots such as Hoppity Hooper, Super Chicken and George of the Jungle. Baldwin had a flair for turning the limitations of low-budget animation into assets while squeezing out the highest possible entertainment value. Now, you can learn a little bit more about the master himself in his new book, From Mister Magoo to Papa Smurf, A Memoir by Gerard Baldwin, available at Amazon and Barnes & Noble. Beginning at his beginning, Baldwin recounts growing up in New York, his decision to become an artist and his sideways move into the medium that would define his career, animation. You'll read about his early days as an inbetweener at UPA, his military service, his return to UPA and his rise as an animator and director in the TV animation industry, culminating in becoming a producer on Hanna-Barbera's The Smurfs. Between his stories from the animation trenches and his wry observations, there are a number of charming drawings illustrating anecdotes from his life. During it's baby boomer heyday, television animation was usually looked down upon, especially by those in the industry. Consequently, very few animators and directors from that era put their experiences and thoughts down on paper; this is rare insight into the art and commerce of 1960s animated cartoons that is of interest to not only those that grew up with the cartoons but for anyone who follows pop culture. You can buy it here.